For a freebie fight card, UFC Fight Night Foxwoods is getting quite the star-studded treatment. 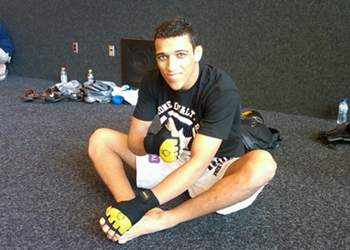 UFC officials have added a featherweight rematch between Charles Oliveira (pictured) and Nik Lentz to the September 5 event. The 145-pounders initially met in June 2011. Oliveira landed an illegal knee on Lentz, which went unnoticed by the referee. The Brazilian promptly pounced and slapped on a rear-naked choke on his dazed and confused opponent. The Pennsylvania State Athletic Commission, the committee who oversaw the fight, reviewed the incident and overturned the verdict to a no contest. Lentz went on to drop his next two bouts, but has rebounded by taking three of his past four scraps. Oliveira is less than two weeks removed from being the first man to finish Hatsu Hioki. “Do Bronx” has also been inconsistent since the incident with Lentz, just winning four of seven contests. Foxwoods Resort Casino in Ledyard, Connecticut hosts the festivities.